Feb. 6 marked the third public meeting for the Lake Mattamuskeet Watershed Restoration Plan. The plan development is funded by a partnership of Hyde County, U.S. Fish and Wildlife Service and N.C. Wildlife Resources Commission. It is guided by an 11-person stakeholder committee and public input, and will be written by the North Carolina Coastal Federation. Stakeholders include members of Hyde County’s residential, farming and hospitality communities, as well as Hyde County employees and representatives from U.S. Fish and Wildlife Service and N.C. Wildlife Resources Commission. Learn more about their roles and responsibilities. At the meeting, the federation and county provided updates on the work that the stakeholder team has undertaken during the past quarter. This includes: updated draft goals for the plan, meetings with researchers who are trying to understand the various water level and water quality concerns of the lake, development of a new “story map,” a web-based tool that helps to explain the need for a watershed restoration plan and recent work by the county to snag and drag many of the county’s canals. Learn more about the various presentations below, and find a compilation of all the presentations at this link. Members of the stakeholder committee have worked for months to help shape the watershed restoration plan and have come up with three overarching goals: protect the way of life in Hyde County, reduce flooding and improve water quality. Read the goals here. 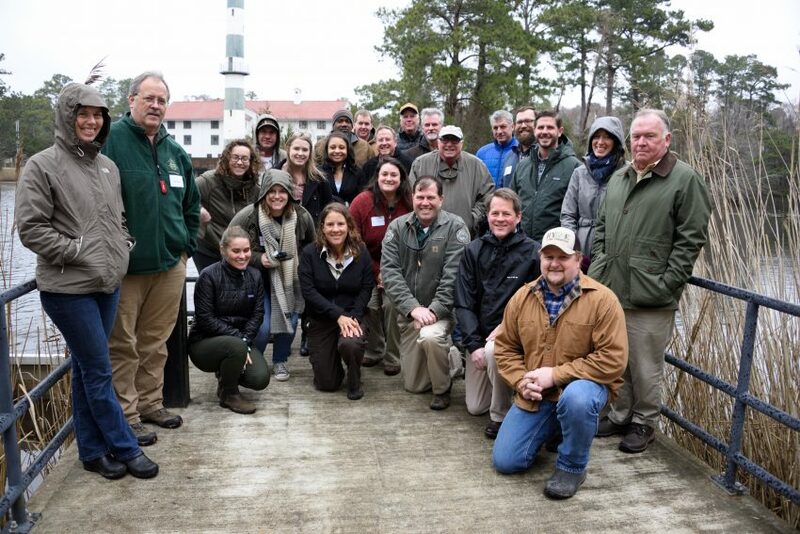 The stakeholder committee and technical working group met Jan. 30 for a day-long meeting, where the technical working group briefed the stakeholders on various research projects that are being conducted in and around the lake. The presentations focused on hydrology and water quality of the Lake Mattamuskeet watershed; moist soil management; submerged aquatic vegetation (SAV); carp removal; herbicides; and nutrient inputs from waterfowl impoundments. Check out the overview of conclusions from this meeting. An online resource, known as a Story Map, offers insight into the benefits that the lake provides to humans and wildlife, the history of changes that have been made to the lake watershed and the current issues it faces. This resource is available at the bottom of this page. 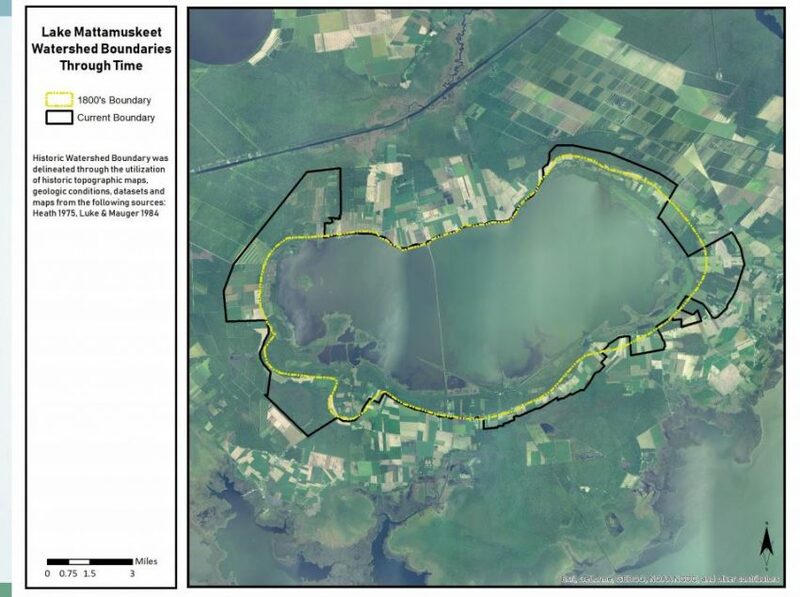 The federation has developed a timeline of Lake Mattamuskeet watershed changes. The timeline helps with plan development as it includes the array of changes that the lake has undergone. The timeline is available here. Members of the public are encouraged to review the timeline and offer any input or edits by emailing Erin Fleckenstein, coastal scientist for the federation, at erinf@nccoast.org or calling 252-473-1607. This timeline is aiding in plan development by helping to characterize the watershed. Check out these maps that were presented at the meeting, which show historic and current watershed boundaries, land uses and drainage boundaries. These maps help illustrate changes to the watershed. Fleckenstein noted that the three top land-uses around the lake are woody wetlands, cultivated crops and developed open space, and noted that there has not been any significant land-use change within the watershed over the last fifteen years that would indicate why water quality is declining. Toward the end of the meeting, Daniel Brinn of the Hyde Soil and Water Conservation District gave an update on efforts to remove woody debris from canals that connect to the lake. This project is funded by the North Carolina General Assembly. The next steps of the plan development are to identify stormwater reduction or water management techniques and to analyze the impact of these solutions. To help drive these steps, the meeting concluded with an activity where attendees gave their ideas on management strategies. This feedback will be incorporated into the plan as it develops. Members of the public are encouraged to assist with documenting the impact of extreme events within the watershed by submitting detailed descriptions and photos that illustrate persistent flood or drought conditions. Please email Michael Flynn at michaelf@nccoast.org or call 252-473-1607 by March 9 and include date(s), location(s), description of impact (such as monetary loss from damages to property, inability to use septic systems or perform work on agricultural land) and any other relevant information. If you also have suggestions for how to improve conditions within the lake watershed, please submit those as well. The next public meetings are planned for May 8, July 10 and Sept. 18 from 7-8:30 p.m. at the Hyde County Government Complex. Stay updated at nccoast.org/lakemattamuskeet.